This broken and tilted section of D dock, shown yesterday at the Ala Wai Harbor, typifies problems at state docks that have gone too many years without preventative maintenance. MANY BOATS berthed in the Ala Wai Boat Harbor will have to find a new home by next week because the state is closing docks deemed unsafe by engineers. More than 100 permanent slip occupants will "probably lose their space" on the B, C and D docks over the next four months, harbormaster Meghan Statts said yesterday. Engineers deemed the floating concrete D dock unsafe last week and official letters informing tenants that they will have to move will be sent tomorrow, Statts said. The closure affects 46 boats that will be relocated to F dock or 800 row. That means boats with short-term permission to dock along the harbor's 800 row have until July 22, and boats along F dock have until July 26 to relocate to another harbor, Statts said. "It's been extremely frustrating -- a nightmare -- trying to relocate all of the boats when you don't have enough slips to accommodate them," said Statts, who referred to it as a "juggling act." When all slips are functioning, the state harbor can accommodate 699 boats, but chronic lack of maintenance had rendered at least 70 slips unusable before the newest closure. This broken and tilted section of D dock was shown yesterday at the Ala Wai Harbor. "Well, they have to do what they have to do," said Lee Maxwell, who will have to relocate his sailboat, now moored at D dock. Maxwell said he wasn't surprised by the news. He said he started doing repairs on his portion of the dock because he knew it was needed, but that the state maintenance staff did not have the resources. Statts said she is trying to make plans for people who live on their boats on B and C docks, because those also might be condemned as unsafe. Tom Buck, who has a 24-foot sailboat moored on C dock, agreed the docks need repair, but did not think it was unsafe or needed to be condemned. "This is a jewel when compared to some other harbors on the island ... you get what you pay for," Buck said. Ala Wai slip fees are about half the price of private harbors in Hawaii and are among the lowest in the nation. Despite several attempts to increase fees, they have not changed in more than 10 years. However, Statts said the slip fees only fund repairs, not replacements, of the docks. "You can see the consequences when you can't make improvements," said Peter Young, director of the Department of Land and Natural Resources, which oversees the harbor. This is not the first time the disrepair of the state's largest public boat harbor has displaced boat owners. In February 2004 the state condemned and demolished F dock, which had 76 slips. Since then, the Waikiki Yacht Club donated a used dock to the state, which has room for up to 35 boats. Before the closure of D dock, Statts said the waiting list for the harbor ranged from two to five years. "It definitely won't move now. Any vacancies I do have, will be filled by those being relocated," said Statts, who did not know how long it would take to either repair or replace the docks. "It depends on if and when we get the money to do it," she said. Statts said many of the docks in the harbor are beyond repair. "They are only supposed to last 25 to 30 years, but they've been out there for more than 40 years," she said. 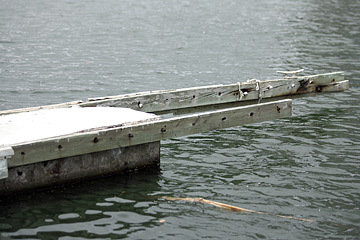 Statts said money to replace docks must come from the Legislature. She said although the governor appropriated $1.65 million to replace F dock by May 2008, the Legislature has denied other funding requests to replace the "outdated docks in dire need of replacement, not repair." Young said his department has requested about $10 million over the past three years, but received none. "The staff is doing everything we can do to keep it from being condemned but it's difficult because there is no funding," Statts said.